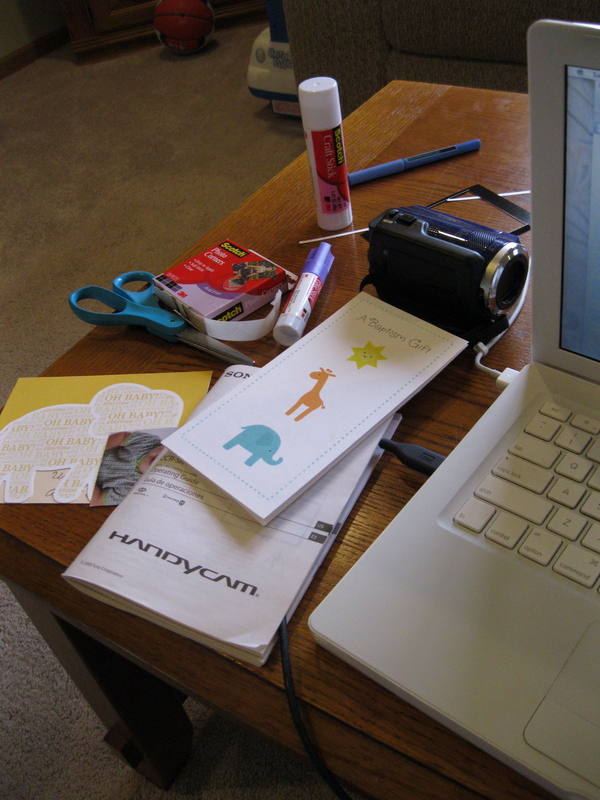 This weekend I finally got the chance to engage in a time-honored tradition of preparing for the arrival of one’s second child: finishing the firstborn’s baby book. 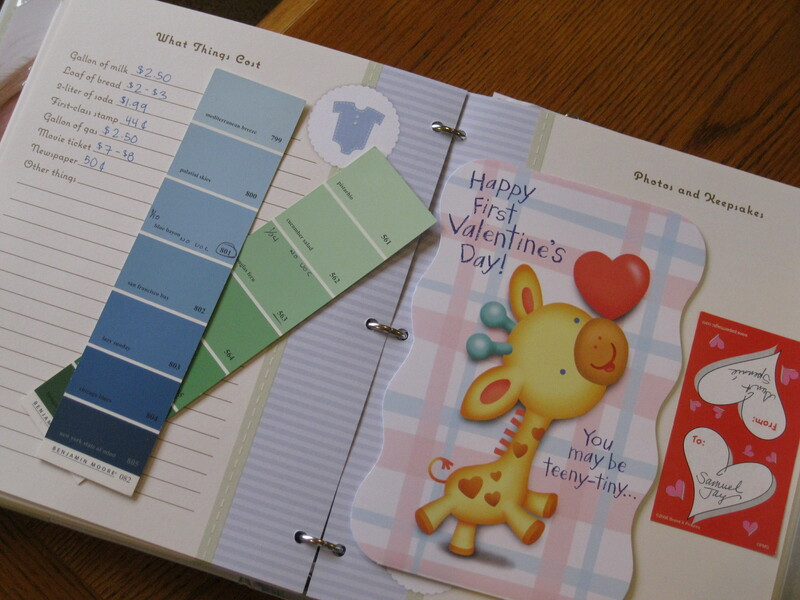 I know there are many gung-ho scrapbooking mothers out there who would shudder to think it took me this long, but I also know I’m far from the only slacker mom when it comes to baby books. My own mother always reminds me that my youngest brother doesn’t even have a baby book, as far as she can remember (or dig up). And my sister assured me that she didn’t finish the book for her first till the second was almost born. As luck would have it, a Saturday of far too many Braxton-Hicks contractions for my liking sent me to the couch. Which did not jive well with my plans to cross lots of to-dos crossed off my list. 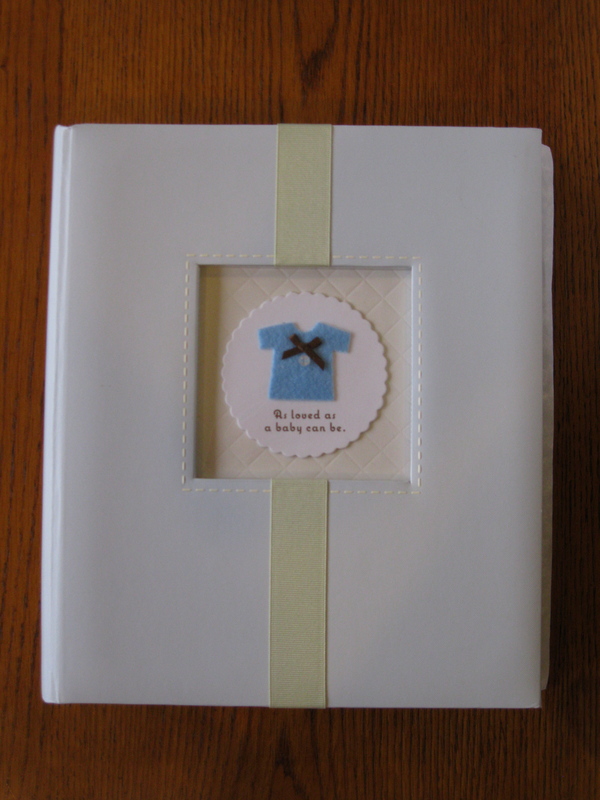 I had to content myself with projects that could be done from the prone position, and finishing S’s baby book suddenly seemed like a brilliant idea. What a trip down memory lane. In order to reconstruct some of the moments I’d forgotten to record, I had to scroll through months of photos on the computer and video camera. I watched S as a cranky newborn, a babbling baby, an eager cruiser, a happy new eater, a cautious walker, and finally the running, giggling, chatting toddler that he is today. I filled his baby book with all the mementos I’d stuck inside along the way: the ticket from his first baseball game, the boarding pass from his first airplane trip, handprints and footprints, Christmas pictures and birthday cards. It made me at once nostalgic for the baby that he was and eager for the prospect of a new baby who will again fill our home with cries and giggles, first steps and first words, silly antics and new learnings. This morning, our parish celebrated the First Holy Communion of approximately one zillion boys and girls in awkward black suits and angelic white dresses. The extra long Mass meant that S and I roamed around the back of church while the throngs went up to receive communion. As always, I was amazed and amused by the number of overeager relatives who practically stampeded each other in the hopes of snapping The Perfect Shot of their little one receiving communion for the first time. On the one hand, I want to delight in their excitement, and I remember looking back on photos taken at the moment F and I took our wedding vows or S was plunged into the waters of baptism. On the other hand, it drives me nuts to see such a sacred moment interrupted by flashing cameras and jostling photographers rushing the altar. I tried to err on the side of Christian charity by celebrating the fact that the church was packed with people who were delighting in this moment, no matter what their reason or rationale. But when we came home from Mass and S settled into a heaven-sent three-hour nap, I had time to finish the baby book and found myself again reflecting on how we document the Big Moments in our lives. Clearly I’m not in the type-A category. Sure, we have lots of photos and even videos of S’s first year – probably much more than F and I have for the first 18 years of our lives combined, thanks to digital technology. But I didn’t post every “first” on Fa.ce.book or email every milestone to friends and family. For one thing, it felt frantic and overwhelming to try and tackle that baby book while we were in the throes of figuring out new parenthood. And furthermore, I felt like the pressure to document every second of my child’s precious babyhood was Too Much. I simply wanted to live it, to soak it up, to dwell in it before it passed all too quickly. The same goes for the sacramental moments. I love our wedding photos more for the overall story they captured – the friends and relatives who shared a beautiful day with us – than for a play-by-play instant replay of our vows. I don’t need the perfect shot of S’s baptism to remember how much that moment meant. No photo could capture the feeling of that wet, wriggly baby after he’d been dunked, the earthy pine scent of the chrism that lingered on his hair for days after the anointing. Likewise, while this baby book is a lovely record of S’s first years of life, it could never capture the whole story. Missing are what I learned as a new mother, all the struggles we went through in the transition to parenthood, the sweet small moments that no one thought to record, the wonder and the personality of the little boy that this baby became. And as I look back over the past two years, I realize we don’t need to memorialize any of that for posterity. It’s who we all became on this journey of raising S. I can let go of the fact that I forgot when he did certain “firsts” or never got around to burning those video clips onto DVD because all I could do at the time was be there, with him, present in the moment. So today I decided that for future sacraments, our relatives don’t need to climb over themselves to get a shot of S when he receives communion for the first time. I just want them to be present there with us in that moment, to watch him take it all in. We can capture the smiles after Mass and click lots of shots at the after-party. But the power and sacredness of that moment doesn’t need to be captured forever on film. We can simply live it instead. Besides, this slacker mama won’t get around to sticking those photos in an album until he gets confirmed in high school anyhow. 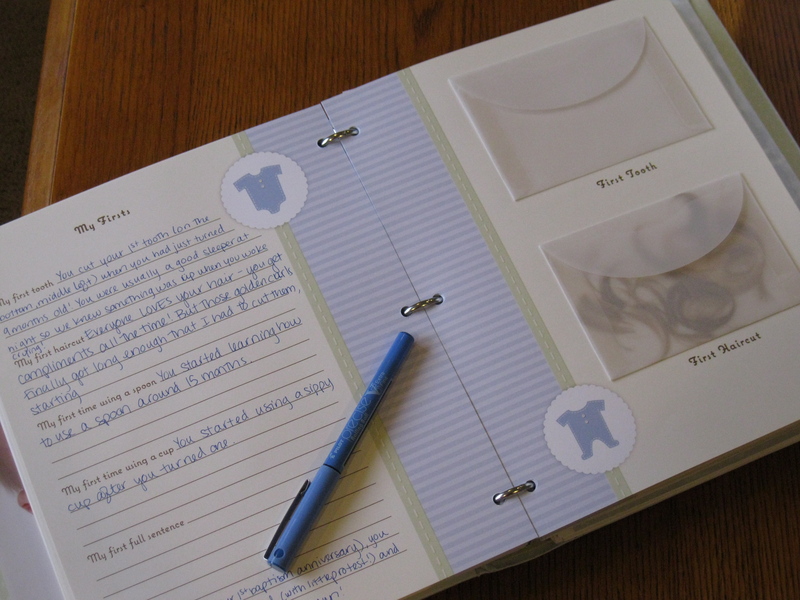 The scrap book looks beautiful from what I can see! What a cute little book. I have the kid’s baby books in the kitchen so I can record fun/funny things that they do and say or milestones. (My mother-in-law said she did that and I thought it was a good idea to have them handy. Otherwise I forget to write it down.) I have also decided to have a “scrap book box” for each kid. If we have a keepsake, I toss it in the box. Someday I will give them the box (probably boxes) and have them decide what they want to keep. That is the extent of my creativity! Ha! I second the idea that pictures should be limited at sacramental moments! I think we often forget or miss what is taking place when we feel the need to document each moment. There are some memories that are best kept in our minds (i.e. : the wedding night…ha! But just as much a sacramental moment as the wedding ceremony). There is (or should be) an intimacy at sacramental moments that does not need to be captured in pictures. The pastor I used to work for would not let photographers get closer than the last pew with people in it. I thought that was a good compromise. That way the cameras were behind the congregation. Oh, such rich food for thought here! I used to feel sheepish about forgetting well after the fact how old my son was, exactly, when he rolled over for the first time, etc. (all those things the baby book ask you for). But as you say, the most important moments are the little ones that aren’t quantified: the snuggles, the baby scent, the little expressions he used to make that he no longer does, etc. THOSE are the things that I cannot forget. And don’t feel bad about being “behind”: my uncle didn’t get a baby book until he was in college and his girlfriend decided to make one for him. He was the last of four kids; I think my grandma was just too tired.